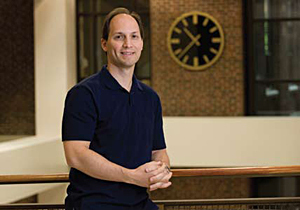 In a research area characterized by observing, manipulating, controlling, and ultimately predicting behaviors of minute particles and small-scale processes, David Corti was drawn to the School of Chemical Engineering for a relatively global reason: growth potential. Corti traces his current research interests — bubble nucleation and colloidal dispersions — to his PhD at Princeton University and postdoctoral work at UCLA. And, as with all compelling research, pursuing these quests throughout his 12 years at Purdue has pointed to more questions. “Our findings offer a new picture of how phase transitions occur in liquids,” says Corti, “and we’re still working through the implications. If we’re able to better control nucleation rates, it could lead to different ways of making materials, or to materials with interesting properties.” Further research also could result in a more precise understanding of the “phase transition” that takes place when bubbles form, grow, and then become a vapor — insights with possible implications for industry. Corti’s joint project with Elias Franses, which is sponsored by the Hewlett-Packard Labs Innovation Research Program, focuses on colloidal dispersions. Specifically, Corti is researching the stability of ink dispersions by controlling the force interactions between pigment particles. “Hewlett-Packard’s concern is with pigment particles in ink that might clog printer-heads,” Corti explains. “By manipulating the properties of these inks, we can examine how fast pigment particles come together or whether they’re well-dispersed. Ultimately, our findings could lead to new ways of making improved inks. In the years ahead, Corti anticipates his findings will move from the School of Chemical Engineering to the industrial world — and possibly beyond.